This Filipino war action film opens up with an on-screen crawl informing us that, in 1966, the U.S. Government planned on ending the Vietnam War by dropping an atom bomb on Hanoi. When the person in charge of that mission, Captain James Brooks, is captured by the enemy, a band of mercenaries, led by Aviles (Rey Malonzo of CLASSIFIED OPERATION - 1985), are hired to rescue Capt. Brooks. 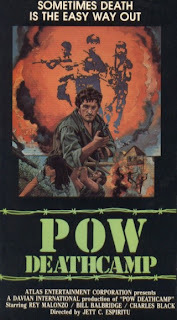 They fight the enemy in the jungle while trying to avoid spiked booby traps (one of Aviles' men steps on a tripwire and gets spiked through his leg) and being massively outnumbered. They save a village girl after she is bitten by a cobra, only they end up being captured by the enemy and sent to a P.O.W. camp. Aviles and his men are tied-up and forced to watch as the sadistic camp warden forces two prisoners to arm wrestle each other, the loser getting shot in the stomach when his opponent's hand touches a lever that pulls the gun's trigger. As the deaths pile up, thanks to the arm wrestling contest and an unsuccessful escape attempt by four American soldiers (who are all shot and killed), Aviles and his men must come up with an escape plan before they are killed. Aviles' second-in-command, Jun (Charles Black), narrowly misses being killed in the arm wrestling contest when he beats the ten-time champion, which leads to Aviles and Jun escaping. They begin to systematically kill the camp guards, eventually freeing all the prisoners. The sadistic camp warden gathers his remaining men and hunts down Aviles and the P.O.Ws. Easier said than done, as Aviles and his men are experts in jungle warfare. The rest of the film is nothing but a series of gun battles and fistfights, ending with a massacre on the banks of a river, where everyone, including the snake-bitten girl from the beginning of the film, loses their lives in a hail of bullets. Isn't war wonderful? This film proves that not all Filipino action films can be winners. 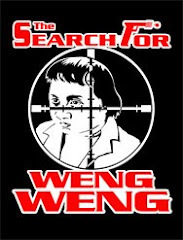 Director Jett C. Espirito (VENGENCE SQUAD - 1987), working with a minimal script supplied by Jeffrey Woods or Bonnie Paradez (since the opening credits lists Woods and the closing credits list Paradez as the screenwriter), doesn't have much to work with here, just a basic premise (that's immediately dropped) followed by lots of shooting and hand-to-hand combat. Ignore the synopsis on the back of the video box, as whoever wrote it obviously didn't watch the film. The only part of the synopsis that's even partly true is that Capt. James Brooks (called "Captain Steiner" on the box) is at the P.O.W. camp that Aviles (called "Lt. Comez" on the box) and his men are sent to. Problem is, he's not alive, as the camp warden reveals Brooks body to his new captives. It's a skeleton wearing Brooks' uniform! All the other character names listed on the back of the box are also false. The middle section of the film, when everyone is at the P.O.W. camp, is filmed at night and most of the time it is too dark to make out what is going on. 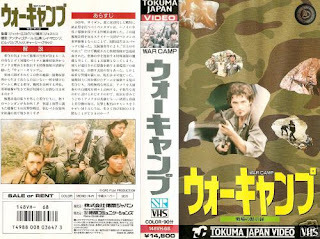 For a war film, it's not very bloody, just a few bloody bullet squibs and a couple of booby trap impalements (and they both look to have been edited to delete the gore, even though this tape doesn't carry a rating). I was kind of excited to watch this when I found a copy on eBay since I never heard of it before, but once I got about twenty minutes into it, I knew that I wasn't in for anything special. It lacked craziness that makes a lot of other Filipino actioners so memorable. Oh, well. They can't all be winners. Also starring George Estregan, Urs Hardegger, Vilma Vitug, Ronnie Valle, Merilyn Bautista, Jimmy Santos and Bill Balbridge. 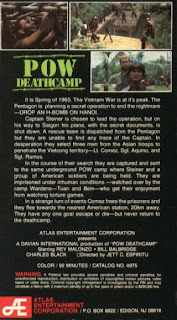 Originally filmed as WARCAMP. An Atlas Entertainment Corporation Release.